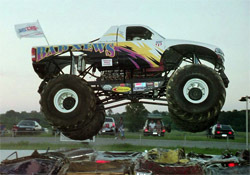 Bad News Travels Fast was conceived by original owner Bruce Haney in 1998. The first truck to bear the Bad News Travels Fast name was formerly the Excalibur truck that Bruce purchased from Charlie Pauken. Bruce competed with this chassis for five years. In 2003, Bruce called Dan Patrick to build a custom Dan Patrick Chassis to accommodate his incredible height (he is 6 foot 8 inches)! This chassis is still in use today. 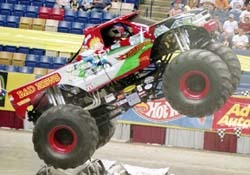 In 2004 Mattel Hot Wheels released a full product line of Monster Jam die-cast, friction trucks, and 1:32 scale vehicles featuring the Bad News Travels Fast name. 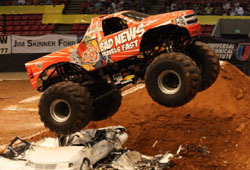 The Bad News toys can be found throughout the United States and Canada and at most USHRA Monster Jam events. 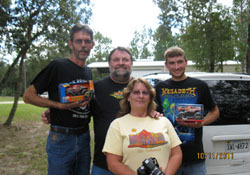 Bruce competed primarily with Feld Entertainment Motor Sports and averaged 35-40 events each year, travelling all over the United States. 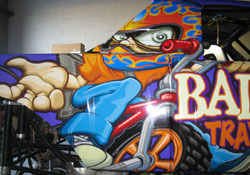 The truck featured three different paint schemes over the years and was a fan favourite wherever he travelled. 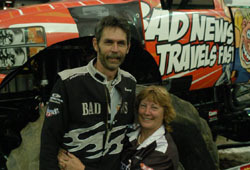 At the beginning of the 2011 Season, Bruce and his wife announced that the truck was available for sale so that the two could enjoy retirement. 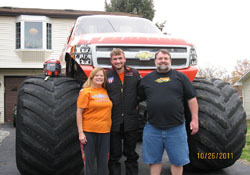 Brandon Derrow and his family purchased the truck in October 2011, and with the help of Bruce, Brandon competed in his first show later that month in Swainsboro, Georgia. 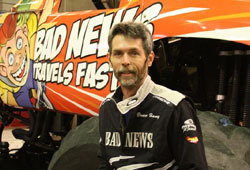 Brandon has vowed to continue the proud legacy of the Bad News Travels Fast name, and follow in the footsteps of Bruce Haney. 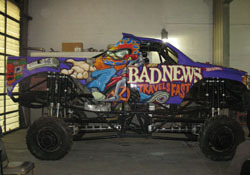 At the beginning of the 2012 Season, Bad News Travels Fast was re-introduced with a new purple paint scheme.